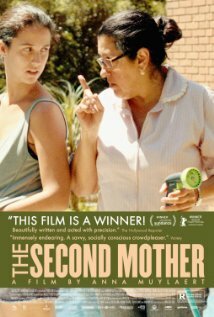 Movie Review: In this pungent, keenly observed comedy from Anna Muylaert, a live-in housekeeper, Val (Regina Casé), awaits the arrival of her estranged teenage daughter, Jessica (Camila Márdila), who leaves Pernambuco, where she was raised by relatives, to come to São Paulo in order to attempt the extremely difficult admission exam for a reputable architecture college. Mother and daughter don’t speak with each other for more than 10 years and both are apprehensive about living together. Val’s plan consists in finding a cheap little place for them, but taking into account the surprise of the arrival, she asks her bosses if Jessica can stay in the house for a while. Three persons compose the wealthy family: Barbara (Karine Teles), a snob who seems to be helpful at first, but immediately feels invaded when Jessica asks to stay in the huge guest room instead of in her mother’s simple and tiny space; Barbara’s husband, Carlos (Lourenço Mutarelli), a frustrated, innocuous former artist who stopped working and gradually develops an embarrassing passion for Jessica; and their son, Fabinho (Michel Joelsas), who was raised by Val as her own child, and whose main concerns at the moment are hiding his weed from his parents and lose virginity. The problematic barriers between social classes are the main subject of Ms. Muylaert’s script, which richly unfolds situations with precise focus and lots of laughs, especially due to the heavenly performance of Regina Casé who gesticulates, pulls a face, talks to herself, and occasionally hangs out with other housekeeper’s friends. Jessica is the character to admire, though. She acts comfortably and with no sense of inferiority in front of whoever, revealing a disconcerting self-assurance that drives Barbara and her afflicted mother crazy, while the lonesome Carlos gets more and more fascinated by her way. She reproaches Val for adopting such a subservient behavior and shows to be hurt for having been left behind. Almost reaching the end, an ultimate plot twist can be seen as an obvious tactical opportunity for some. It worked fine for me, just as the narrative exposure and topic resolution.